Back in the heyday of Saturday morning children’s programming, between superheroes, talking Great Danes, and commercials for sugary cereals and Star Wars action figures was Schoolhouse Rock. These three-minute, animated, educational videos played on ABC off and on from 1972 to 2001. They covered mathematics, grammar, science and American history. I couldn’t say whether they actually reinforced what we were learning in school, but they were fun to watch and the music was always catchy. All of the original episodes were released on a 30th Anniversary Edition DVD in 2002. 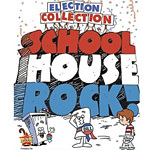 Trying to capitalize on the upcoming presidential election, Schoolhouse Rock: The Election Collection has 15 episodes, only two of which are new to this DVD). Only three of the episodes on the DVD actually touch on voting, and two of those were made for home video. The other episodes cover a wider range of topics; American history (Shot Heard ‘Round the World), finance (Tyrannosaurus Debt), government (I’m Just a Bill), and other pressing issues (Energy Blues). There are two versions of Presidential Minute, a new video made for this DVD. It would be easy complain about how the segments oversimplify their topics, but at three minutes long, the episodes provide a decent introduction to history and civics for the elementary-school set. Many of them — Energy Blues, Walkin’ on Wall Street and Tyrannosaurus Debt — are just as topical today as when they were made. With a running time of only 45 minutes, the content of the DVD is a little thin. Fans of Schoolhouse Rock, or anyone who hopes their kids will become fans, will find that the 30th Anniversary Edition is a better value (check some online sellers for prices). It has three times as many episodes and a whole host of bonus features. There are no bonus features on the DVD itself (although two versions of Presidential Minute were made for this DVD), except for advertisements for other Disney products. For young political enthusiasts, there is an “Election Tracking Kit” in the DVD case. It’s an electoral map of the United States and sheets of red and blue stickers. The videos are presented in full-screen. Some of the older episodes are a little grainy, but on the whole, the picture is pretty good. According to the DVD case, the sound is Dolby Digital 5.1, according to our DVD player, the sound is Dolby Digital 2.0. In any case, surround sound isn’t necessary to enjoy these videos. Watch the episodes at your leisure. Consider interspersing them with episodes of Scooby Doo or the Superfriends for an authentic 1970s Saturday morning experience. Pull out that map on election night and start stickering.